A very large and truly awesome Study Abroad program is the highlight of Arcadia - previously known as 'Beaver College' - a relatively small school in suburban Philadelphia that boasts strong pre-professional programs, especially in physical therapy, and a very respectable number of on-campus gargoyles. Describe the type of student who should not attend Arcadia University and explain why. If you're not ready to enjoy all things nerdy and weird in a way, Arcadia is probably not for you. We also have no sororities and fraternities, and no football team. Describe the type of student who should attend Arcadia University. Why? What is a typical Arcadia University student like? Describe the type of person that should attend Arcadia University. What are the top 3 reasons someone should attend Arcadia University? The top three I would say are the beautiful landscape, the diverse cultures present and the very caring professors who will work with you any way they can to ensure a student's success. What was a typical Arcadia University student like in high school? Describe the type of person that should attend Arcadia University. Arcadia University exhibits a great deal of variety among the student body. If you enjoy being around people from all sorts of different backgrounds, and studying alongside students in from different communities or countries, then Arcadia is for you. A vibrant, engaged campus revolves around the historic Grey Towers Castle and the new Commons student center. Arcadia is Philadelphia's global university and a pioneer in international education. Arcadia is a top-ranked private university offering bachelor's, master's and doctoral degrees. More than 4,000 students choose from more than 65 fields of study. U.S. News & World Report ranks Arcadia University among the top tier of regional universities in the North and the Institute of International Education ranks Arcadia first in the country for the percentage of undergraduate students studying abroad. What are the top 3 things that students do for fun at Arcadia University? 36% of students received Pell Grants, which are provided by the U.S. government to students from middle and lower income families. It gives you an idea of a school’s socio-economic diversity. Campus housing is available for undergraduates. Housing deposit : $400. Housing deposit due : May 1. Housing deposit is not refunded if student does not enroll.. No cars. No pets. 54% of students live on-campus. A program that prepares individuals creatively and technically to express emotions, ideas, or inner visions by fashioning art works from gems, other stones, and precious metals. Includes instruction in gemology, metalsmithing and finishing, stone cutting and polishing, metal and non-metal casting and molding, electroforming, metal coloring, enameling, photo etching, lapidary technique and art, design concepts, and personal style development. A program that prepares individuals to apply the principles and techniques of art and computer-assisted imaging, graphics, and animation to create visual materials to facilitate the recording and dissemination of biomedical knowledge for educational, research, and clinical purposes. Includes instruction in anatomy, physiology, pathology, histology, embryology, neuroanatomy, medical terminology, artistic media and techniques, illustration techniques, three-dimensional modeling, prosthetics, data display design, exhibit design and production, medical photography, multimedia, computer graphics and animation, digital imaging, business management, production technology, and instructional design. Any instructional program in international relations and national security studies not listed above. Any instructional program in library science not listed above. 57% of students graduated in the top quarter of their class. 27% of students graduated in the top tenth of their class. The average student pays $26,151 for tuition, fees, and other expenses, after grants and scholarships. Total stated tuition is $36,150, in-state and on-campus, before financial aid. Learn more about financial aid at http://www.arcadia.edu/prospective/default.aspx?id=606. Estimate the net price for you at http://www.arcadia.edu/admissions/default.aspx?id=3482. The typical (median) early career salary of Arcadia University graduates is $35,000, according to Payscale. Arcadia University participates in the NCAA Division III for college athletics. 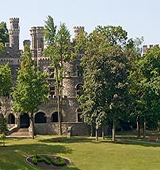 Want more info about Arcadia University? Get free advice from education experts and Noodle community members. Does Arcadia University have a large study abroad program?